Since hiving the little swarm in May, the bees have contentedly worked the top box of the Warré Hive. In a record-setting hot and dry year, they bearded into the bottom box but never built any comb in it. Aside from some late-season feeding, I left the colony undisturbed to go about their business all season long. Even when it became apparent that they weren't going to build comb in the bottom box, I stopped feeding them syrup but left the hive-top feeder on; I just didn't want to mess with them at all. And it was easier to do nothing than to remove it. At the hive entrance, traffic has been busy, pollen (and presumably nectar) is still coming in, and they're fending off the occasional fly or wasp. Watching them happily come-and-go and thinking about what they need to survive Winter, but not knowing what's going on in their one occupied box, I've imagined two scenarios. They either have stored lots of honey, which means there's not enough bees to get through Winter. Or they have enough bees, but then surely don't have enough food. If they have more food than bees, well... what would you do? Late-season requeening with a vigorous layer isn't a viable option, as we don't have Warré-sized drawn comb to give her to lay in. We could try to overwinter the one box as a nuc on top of the Top Bar Hive inside the bienhaus, but that would entail moving the hive, possibly manipulating the TBH, cutting a separate entrance for the Warré bees in the greenhouse glazing... yikes. Alternately, we could combine the hives. This would add to the workforce in the Top Bar Hive, but also would mean killing one of the queens. And then we'd end up with an empty $350 hive. And don't even get me started on the $44 hive-top feeder. Wishfully thinking, if the colony has enough bees and not enough food, they may survive if we feed them right through Winter. So using some top bars that my friend, Cristina, had made for me, we made an eke, or feeder rim. The 1 3/4"-wide top bars were repurposed to raise the quilt up and provide a space to put food in the hive during the Winter. Unfortunately, the roof doesn't telescope down far enough to cover the rim, and I'm worried the whole rim/quilt/roof will just slide off. It may be too late for the bees to propolize it down, so we need to secure it and seal the gaps to keep heat in & moisture out. Dare I use my Hello Kitty duck tape? Syrup feeder off, mountain camp-style feeder on. Why didn't we just open the hive to see which scenario was playing out? Nestduftwarmebingdung. The first rule is to not interfere with the rhythms of the beehive. Leave the bees alone and they will be much better off. Give the bees plenty of room to build. When they build comb almost to the floor, provide another box under the bottom hive box. Leave enough honey for the bees to eat during the winter. At the end of the summer, when you take off honey, you will want to leave about 26 pounds of honey (one full super). These three rules can be distilled into one: preserve the nestduftwarmebingdung. Essentially don't open the hive and release the warmth/scent of the brood nest unless you have to. Now, bees never follow rules and I think that beekeepers should break them judiciously, but opening the hive wasn't really going to help us much. We wouldn't be able to see much from either the top (there's only gaps b/n 5 top bars) or the bottom where I'm sure the combs are wonky. And since the queen is definitely in that box, there was the risk that she'd be injured. These bees are calm and a pleasure to watch... we'd hate to lose her genetics. Thank you for the invite, @Anita. Hope you get lots of links! The Warré's been interesting to work with, but the work's been with the hive, not the bees. I definitely don't have my legs under me with the Warré as I do with our TBH. For me, working the hTBH has been instinctive. To some extent, its simplicity limits how much we can do. The solid bottom board means there's no need to think about whether to leave open or to close the bottom. No gapped bars means there no easy way to winter feed other than a slab of fondant slipped under the cluster or perhaps hung next to them. The almost full-width window allows us to see what's going on without actually going in the hive, which I absolutely LOVE. The Warré, on the other hand, gives us options and suddenly I feel overwhelmed. In the TBH I would've used the follower to keep the space tight, so why did I start the Warré bees with 2 boxes? Did I make the right choice buying a sump style screened bottom board? Should I close it off or leave it open? Now that we have gapped bars, I can put emergency food above the cluster but what? Fondant? Dry sugar? And where should I store the hive-top feeder that's all sticky with propolis? If we start a 3rd colony, it'll probably be in a TBH. 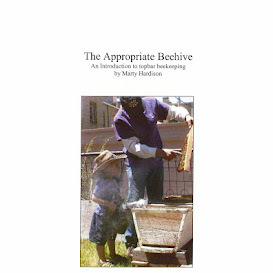 We have a Hardison Hive waiting and, if lucky, we'll super it with Warre boxes. The best of both worlds. It is interesting to hear you talk about all the options with the warre hive. Just one more thing to think about. I got my first TBH this year. They are doing well despite the fact that they are a smaller hive than I would like them to be going into winter. I hope they make it through okay. Have you tried feeding the TBH dry sugar in the bottom or just fondant? @Anita They're always smaller than you'd like, aren't they? We've not tried dry sugar on the bottom board. One challenge with non-gapped top bars is they form a solid ceiling, and you can't do things like dusting the bees w/powdered sugar, or dropping dry sugar down where the cluster is. That leaves you w/dumping the sugar in the back, and hoping the bees can break cluster to go get it. (Trying to push anything across the floor never works for us, 'cuz our bees build blobs of "stuff" on the floor.) Anyway, to answer your Q: we have provided fondant, hung in a wire cage off a top bar. It was put behind the last honey comb, just in case. Unfortunately, that colony downsized itself prematurely and never made it past the first real cold spell. The cluster was too small to maintain enough warmth to move, and they starved. So the fondant was not touched. I stored it for a year+ until I needed my freezer space. I dissolved it into syrup, to give to my Warré bees this Fall. Despite the rigamarole of getting the thing to not leak, I like the ability to hive-top feed. I just made new fondant last night and popped in over the Warré bees today. This time I added anise oil and some pollen. Will let you know how they like it. package bees on April 18th the queen was DOA which just threw me for a loop. I ordered another and 3 days later she was released and soon after I found 3 queen cells 3 more would follow. Apparently the queen was not productive enough but they did use eggs to make 6 queens which I would assume went well as we soon had one nice healthy queen and she has done well ever since. 5 or the 6 queen cells were empty one we tore out later. the problem was that during all of this we had a lot of rain and very cool mornings so it was a slow go. They struggled to keep their numbers up with the fiasco of dead queen and rearing another that would go out breed and make it back again, we lost a lot of time. I have kept a detailed log of all events but for the sake of expediency I will just give the highlights. I have gone into my hive every week sometimes twice a week in the beginning so that nothing went bad wiothout my knowing. Upon one of my inspections I realized that there were simply not enough bees to do all the duties so a friend gave me two frames of brood which I place in there about a month or so ago. What I didnt plan for was that when this brood hatched out they would quickly go through the small stores the weak hive had available and sure enough three weeks ago as I delighted with the large numbers of bees and good activitly at the entrance when I looked in there were no stores at all. And because there was no food the queen had stopped laying and there was little to no brood capped or optherwise. I began feeding 2:1 sugar and the following week everything had cranked up again with stores and capped brood all on the same frames. They ate about 1 quart to 1 1/4 quarts a day and as I saw things going better and pollen coming in I stopped filling it three days ago and they are now finishing up what is left. My question is that here in North Ga we have had a dearth and I fed through it but wildflower and golden rod are blooming so I assume that is where the pollen is coming from, should I continue to feed knowing it might cause them to stop foraging or should I let them work on their own now through this last flow till first frost. Also if I want to feed pollen patties should I be ordering them now? Do I remove the feeder box and put pollen patties on top of frames in the center of the box? Would love to get some feed back if possible. Yes, order pollen patties now – some suppliers may be sold out as this is the time to beef up populations for winter prep. I am not sure what you mean by a feeder box, but yes the patty should be placed directly on the top bars, immediately above the cluster. Right over their heads.